While bins for different kinds of garbage are a common sight in the U.S. and Europe, a system of separate waste collection has only recently begun to develop in Russia. Landfills, covering over 30,000 square miles in total, still represent a major environmental challenge for the country. But experts approached by RBTH noted certain improvements in both separate waste collection and recycling. Stroll around many cities in Western Europe or the U.S. and you will see bins with separate sections for different kinds of waste, while in residential neighborhoods houses and apartment buildings typically have colored bins for differentiated garbage collection. But as the West becomes ever more eco-friendly in its approach toward waste disposal, Russia is finding that developing momentum is much harder than maintaining it. In Russia, despite increasing environmental awareness among citizens, no full-fledged system of separate waste collection is currently in place. “The area covered by landfills is constantly expanding,” Greenpeace Russia representative Violetta Ryabko told RBTH, explaining that the space occupied by waste disposal sites in Russia is currently equal to around 30,000 square miles, or slightly smaller than Croatia. Nevertheless, big cities do make attempts to implement local waste management systems. Dmitry Levenets, founder of the Recycle environmental project, says Moscow municipal authorities have initiated an experiment, installing recycling containers intended for separate waste collection in some districts. “According to the head of Moscow Municipal Department of Natural Resources, city residents are using those bins eagerly,” said Levenets. The experiment was started back in 2012, and has since been expanded to include five city districts in total. However, as experts from Greenpeace Russia have recently discovered, the experimental waste sorting and recycling program was being carried out with some serious violations. The environmentalists say a quarter of the recyclable materials collection centers do not function, glass waste is not collected at all, and waste sorting facilities are often installed on trucks which patrol the city in an erratic pattern. Dmitry Levenets told RBTH that in Moscow there are also several privately-operated recyclable materials collection centers, and the number of people visiting them regularly doubled over the last year. “Urban activists cannot stay away from the problem of waste sorting and recycling, so they arrange mobile waste collection centers staffed by volunteers,” he said. Meanwhile, steps are also being taken to develop the country’s recycling capabilities in more specialized areas. Levenets mentioned Russia’s first battery recycling plant, recently opened in the Urals city of Chelyabinsk. “We are talking about a new Russian-developed technology here – 82 percent of the materials comprising a battery get used again. In Europe, this factor never exceeds 60 percent,” he said. 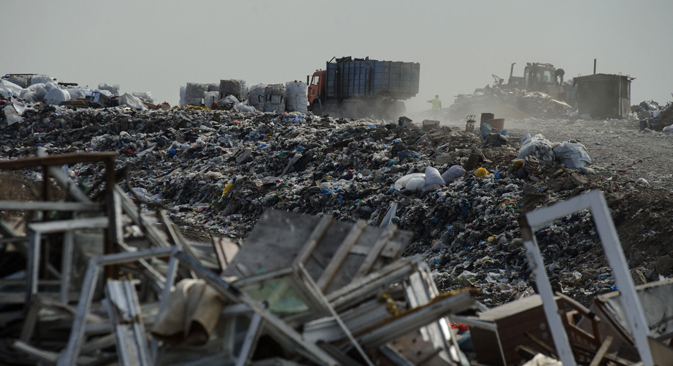 According to Violetta Ryabko, while “many people are aware of the problem of landfills and the dangers of waste incineration plants,” the main problem of waste recycling in Russia is the absence of a separate waste collection system that would cover apartment buildings. “Thousands of citizens collect recyclable material at home and deliver it to collection centers monthly, but they often have to cross their whole city to get there,” she said. Dmitry Levenets agrees: “According to some polls, almost 75 percent of Russian city dwellers are willing to sort their waste, provided special containers are installed near their homes,” he said. Ryabko says plants recycling paper, plastic and metal waste are now emerging in various regions of Russia. “That said, the PaltusPET bottle recycling plant in the Moscow Region – for one – is currently at less than 50 percent of its production capacity simply because there is not enough recyclable materials,” she said.